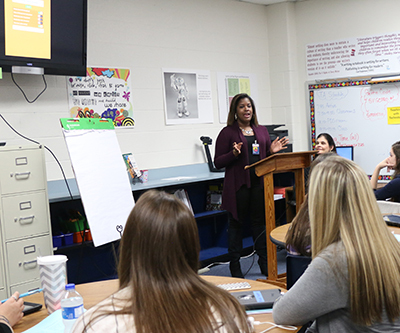 When Dr. Leanne Howell created and implemented an instructional technology series for her Baylor teacher-education students, she had no idea that it would blossom into a revolutionary program that improved student engagement in the classroom exponentially as well as garner her state recognition. Yet that is what it did. 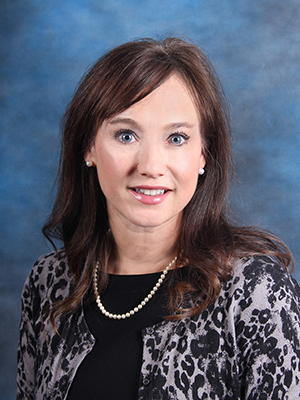 Howell, a clinical assistant professor in the Baylor School of Education’s Department of Curriculum & Instruction, is also the university liaison for the School of Education at Spring Valley Elementary School, a professional development school (PDS) campus of the SOE. Howell received the Exemplary Faculty Practice Award from The Consortium of State Organizations for Texas Teacher Education (CSOTTE) for her groundbreaking work and research implementing technology in the classroom for Teaching Associate (TA) students (Baylor juniors). Howell created a program through which pre-teaching students could educate and engage diverse student populations while using instructional technology. Her plan entailed using technology applications to assist her TAs in designing and implementing effective instruction. 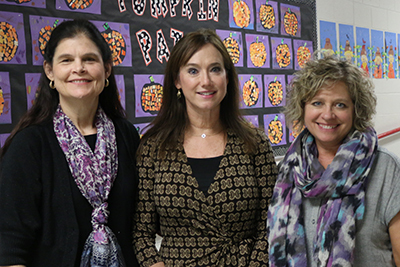 Howell said that Spring Valley PDS site coordinator Paula Gardner (left) and technology specialist Kathleen Minshew (right) were instrumental in the program’s success. Every Tuesday during this past semester, Howell’s students met in the professional development classroom to learn new classroom technology, in a series taught by Kathleen Minshew, the instructional technology specialist at Spring Valley Elementary. Each of the TAs teach small groups of 5-6 students every day, so after the information session, they used the various platforms and applications as part of their curriculum during the week. Some of the applications that the TAs used included Book Creator, Kahoot, Animoto, Edmodo, iMovie, Google Docs and QR codes. The activities were so riveting that even the classroom teachers learned the technology and got involved! For Howell, the award was an opportunity to bring notice to the people who worked alongside her to make her plan successful. In addition to Minshew, Paula Gardner, site-based coordinator for Spring Valley, was instrumental in the project. Gardner co-teaches daily with Howell in the PDS classroom. At the end of the semester, Baylor juniors shared their experiences in educational technology with their classmates. Howell also noted the support of Midway ISD, through superintendent Dr. George Kazanas and also Dr. Brent Merritt. assistant superintendent of curriculum and instruction. Spring Valley principal Jay Fischer was invaluable, Howell said, and invited his staff to attend the weekly technology sessions on Tuesdays. Howell said the award is a testament to the way at Spring Valley and Midway ISD worked together. In her eyes it was a group effort all the way, and in the end everyone benefited.